Perrier-Jouët is a Champagne producer based in the Épernay region of Champagne. The house was founded in 1811 by Pierre-Nicolas Perrier and Rose Adélaide Jouët, and produces both vintage and non-vintage cuvee, approximately 3,000,000 bottles annually, with its prestige label named Belle Epoque. Perrier-Jouët owns 266 acres of vineyards in the Champagne region. Today the house is under the Pernod Ricard umbrella of brands. Perrier-Jouët owns over 160 acres of vineyards, with more than half in the Grand Crus of Cramant and Avize. The correct pronunciation of the label is [pɛʁje ʒuɛt]: the two dots on the e of Jouet mean that the next letter t should be pronounced (but softly, like wet). This origin story of those house dates to 1810, when the Épernay-based cork supplier Pierre Nicolas Perrier married Rose Adélaide Jouët, the daughter of a Calvados producer. Perrier’s family owned vineyards in Dizy, Chouilly, Aӱ. 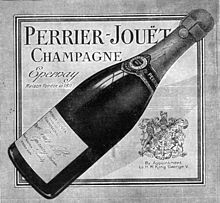 Having been married just one year, the newlyweds begin producing champagne under the name Perrier-Jouët. Adèle focused on vineyards and winemaking; Pierre Nicolas focused on sales and marketing. Shipments to Great Britain began in 1815 and to the United States in 1837. One of the three bottles of the world's oldest champagne, a Perrier-Jouët (vintage 1825) was opened and tasted in 2009. ^ Juhlin, Richard (2002). Tretusen Champagner (in Swedish). Stockholm: Wahlström & Widstrand. p. 224. ISBN 91-46-20022-3. ^ White, David (2016). But First, Champagne (1 ed.). New York, NY, USA: Skyhorse Publishing. p. 163. ISBN 978-1-5107-1144-0. ^ Baveret, Frédérique. "Pronunciation". pernod-ricard.com. ^ personal e-mail: "We are pleased to confirm that, having two dots on the "e", the next letter "t " should be pronounced. You have to say perrier zhou-ette. Yours faithfully, Frédérique BAVERET, VIP & Hospitality Manager, Champagne Perrier-Jouët"
^ White, David (2016). But First, Champagne (1 ed.). New York, NY, USA: Skyhorse Publishing. p. 162. ISBN 978-1-5107-1144-0. ^ "10 Things Every Wine Lover Should Know About Perrier-Jouët". Wine Searcher. Wine-Searcher. Retrieved 24 September 2016. ^ White, David (2016). But First, Champagne (1 ed.). New York: Skyhorse Publishing. p. 163. ISBN 978-1-5107-1144-0. ^ White, David (2016). But First, Champagne (1 ed.). New York: Skyhorse Publishing. p. 164. ISBN 978-1-5107-1144-0. ^ "University of London - Graduation Dinner - Guildhall - May 19, 1920". menus.nypl.org. New York Times. May 19, 1920. p. 2. Retrieved 24 September 2016. ^ Julian Joyce (20 March 2009). "World's oldest champagne opened". BBC News Online. ^ "A visit to the Perrier-Jouët Cellars in Epernay". london-unattached. Retrieved 29 March 2016. This page was last edited on 30 September 2018, at 19:58 (UTC).